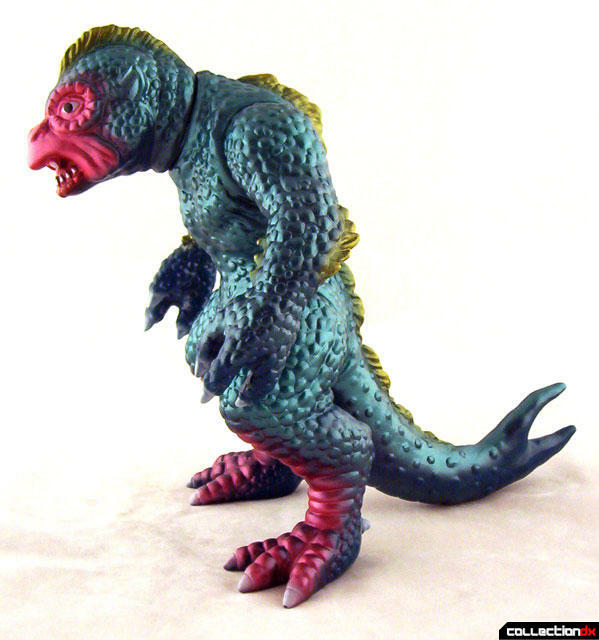 The third entry in the Ray Harryhausen Film Library series by Beagle and Pilot Ace is the Ymir, a monster from Venus (yes, the planet Venus) from the 1957 science fiction classic "20 Million Miles to Earth". 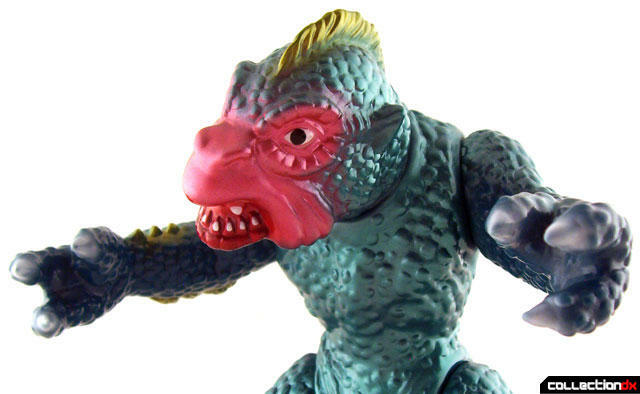 The Ymir is one of the more popular monsters from the Harryhausen catalog. This figure is just a shade under 9" tall and is approximately 12" diagonally from the head to the tip of the tail. Cast in green vinyl with gold and dark pink highlights, it's a fetching color scheme that compliments the previous releases (Cyclops and Fire Dragon) very well. I don't recall seeing an alternate color scheme released for this figure, but I may have just missed it. I hope I did miss it since this would be the first in the series to NOT have an alternate release and that might not bode well for the line continuing if so. As you may know, one half of the companies involved (that being Pilot Ace) has gone out of business and there's been no news about the proposed fourth entry in the line, Kali. 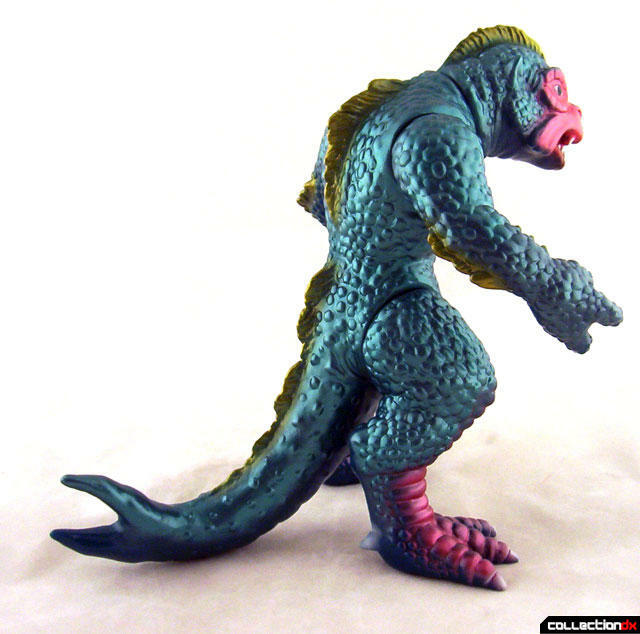 I really want this line to continue since it is exactly the sort of thing I'm interested in these days, toys that I call "missing link" toys. Toys the bridge the gap between my Japanese robot and kaiju hobby and my American monster hobby. These toys are perfect for that. 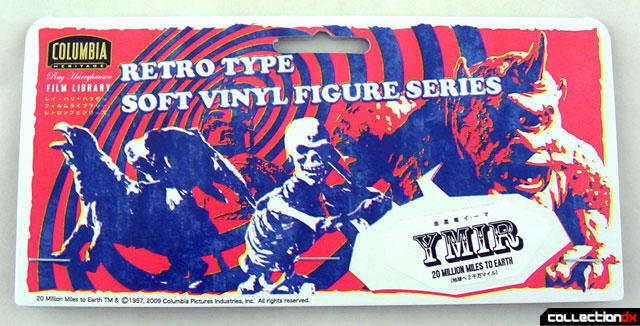 This Ymir figure has 5 points of articulation (hips, shoulders and neck). Unfortunately, there is no joint that allows you to move the tail. I never noticed that the Ymir has chicken feet until I got this. Just like the Fire Dragon, Ymir utilizes the same header card as Cyclops, but again a sticker has be placed over the logo denoting the character included. The vinyl is thick and solid and the paint apps are just fine. As with most vinyls, what you see is what you get. No real surprises here. Beautiful! Crazy colorway on this one. Totally not what I would've expected for this toy (the movie, afterall, is in black & white...I was kinda expecting a more or less uniform color). Any chance we can get a group shot with all three together?? That wouldn't happen to be my alltime favorite Macross toy off to the left,there,would it? 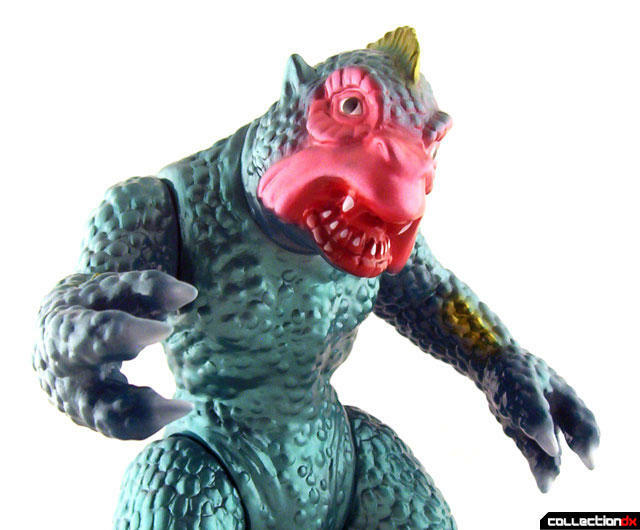 Ymir looks like he's gonna eat that little heisei-goji!